Definition at line 218 of file axextend.idl. Definition at line 221 of file axextend.idl. Referenced by FilterMapper3_RegisterFilter(), FM2_ReadFilterData(), register_codecs(), register_filters(), test_fm2_enummatchingfilters(), test_register_filter_with_null_clsMinorType(), and test_render_filter_priority(). Definition at line 226 of file axextend.idl. Referenced by FilterMapper3_RegisterFilter(), FM2_DeleteRegFilter(), FM2_ReadFilterData(), FM2_WriteFilterData(), register_codecs(), register_filters(), test_fm2_enummatchingfilters(), test_register_filter_with_null_clsMinorType(), and test_render_filter_priority(). Definition at line 220 of file axextend.idl. 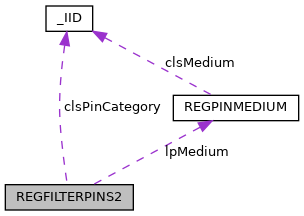 Referenced by DEVENUM_ReadPins(), fill_filter_data_information(), FilterMapper3_EnumMatchingFilters(), FilterMapper3_RegisterFilter(), FM2_ReadFilterData(), register_dsound_devices(), register_filters(), register_midiout_devices(), register_vfw_codecs(), register_waveout_devices(), test_fm2_enummatchingfilters(), test_register_filter_with_null_clsMinorType(), and test_render_filter_priority(). Definition at line 223 of file axextend.idl. Referenced by DEVENUM_ReadPinTypes(), FilterMapper3_EnumMatchingFilters(), FilterMapper3_RegisterFilter(), FM2_DeleteRegFilter(), FM2_ReadFilterData(), free_regfilter2(), register_codecs(), register_dsound_devices(), register_filters(), register_midiout_devices(), register_vfw_codecs(), register_waveout_devices(), test_fm2_enummatchingfilters(), test_register_filter_with_null_clsMinorType(), and test_render_filter_priority(). Definition at line 225 of file axextend.idl. Referenced by FilterMapper3_RegisterFilter(), FM2_DeleteRegFilter(), FM2_ReadFilterData(), register_codecs(), register_filters(), test_fm2_enummatchingfilters(), test_register_filter_with_null_clsMinorType(), and test_render_filter_priority(). Definition at line 222 of file axextend.idl. Referenced by DEVENUM_ReadPinTypes(), FilterMapper3_EnumMatchingFilters(), FilterMapper3_RegisterFilter(), FM2_DeleteRegFilter(), FM2_ReadFilterData(), FM2_WriteFilterData(), free_regfilter2(), register_codecs(), register_dsound_devices(), register_filters(), register_midiout_devices(), register_vfw_codecs(), register_waveout_devices(), test_fm2_enummatchingfilters(), test_register_filter_with_null_clsMinorType(), and test_render_filter_priority(). Definition at line 224 of file axextend.idl. Referenced by FilterMapper3_RegisterFilter(), FM2_ReadFilterData(), FM2_WriteFilterData(), register_codecs(), register_filters(), test_fm2_enummatchingfilters(), test_register_filter_with_null_clsMinorType(), and test_render_filter_priority().